On Canada Day last year, my family and I ventured to Canada Place to participate in the festivities celebrating our great nation. One of the food stalls that we came across was that of Dunn’s Famous. We decided to go with some Canadian-inspired eats including a Montreal Smoked Meat Sandwich ($13.50) and Dunn’s poutine ($10.50). The Montreal Smoked Meat from Dunn’s was quite tender and not chewy. It definitely had an strong flavour profile – salty and smoky. The meat slices were thickly cut and it was a quite handful. I would definitely say that Dunn’s version of the Montreal Smoked Meat Sandwich is closer to the Shwartzs’ in Montreal. 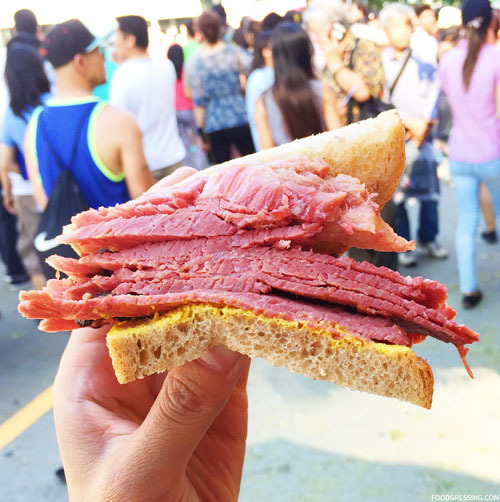 In Vancouver, I had tried Phat Deli’s Montreal Smoked Meat tasted closer to deli meat than the authentic one. 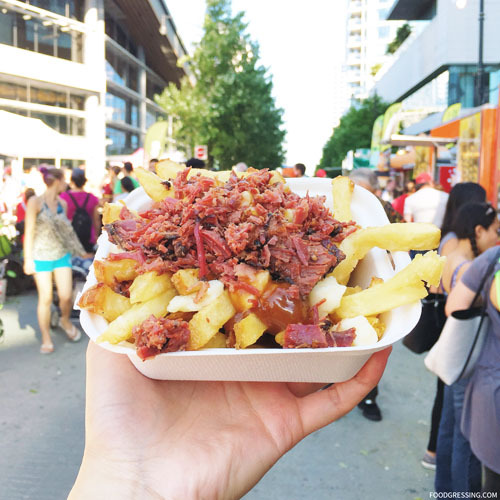 Dunn’s poutine came with BBQ gravy and chopped smoked meat. Pretty good overall with decent portions of meat. 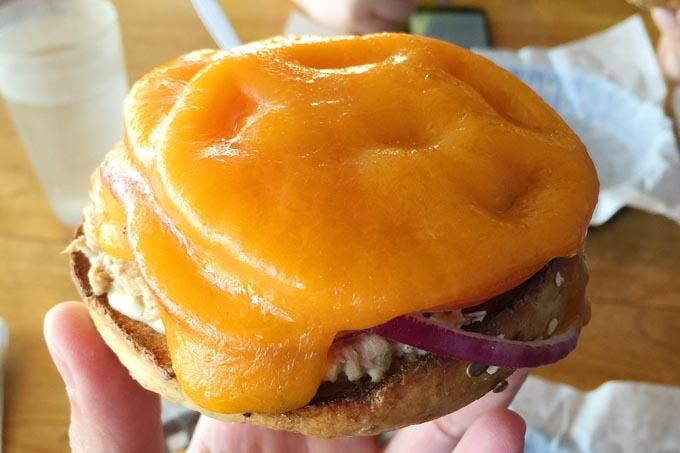 Some of the cheese curds were not as soft and melted as I would like. 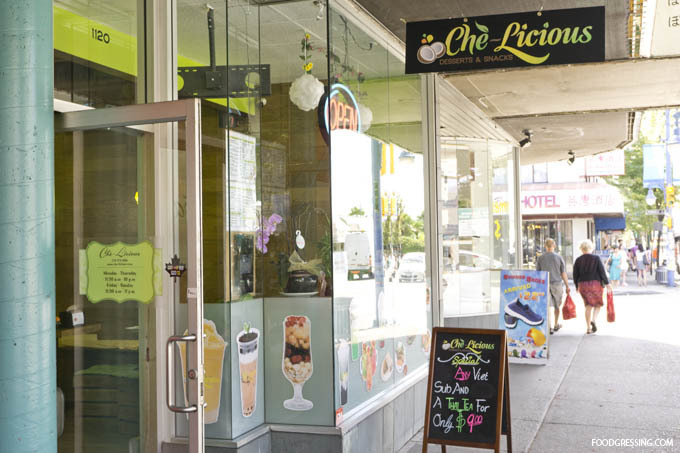 Che-Licious brings the lively flavours of Vietnam to the streets of the West End. After seeing mouthwatering and colorful photos of Che-Licious’ dishes on Instagram, I had no choice but to visit this cute little café on Denman. Their menu has the quintessential Vietnamese dishes like banh mi and salad rolls, but social media is all over their colourful desserts. Chè is a Vietnamese term that refers to desserts. 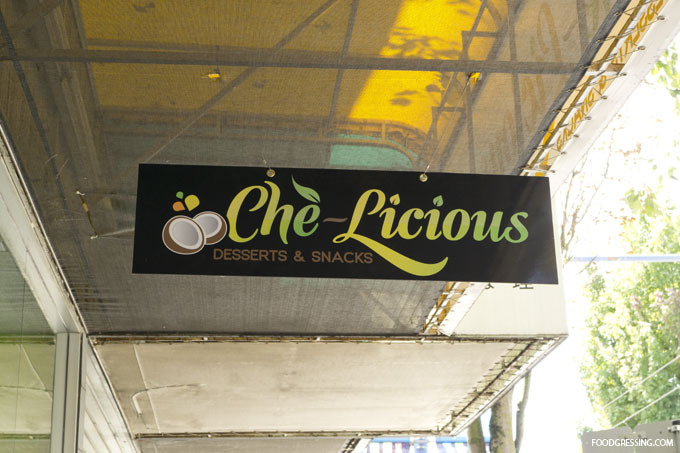 Che-licious offers a variety of sweet dessert beverages made with typical ingredients for chè like mung beans, pandan jelly and aloe vera. Create your own chè starting at $5.25 or get one of their signature ones which cost between $5.75 – $6.50. Bubble tea is also available at around $4.00. On a hot and sunny afternoon, I tried the popular Che-Licious Special ($6.50) made with pandan jelly, agar jelly, pom pearls, toddy palm, jackfruit, longan, and coconut milk. The colourful drink was eye-candy and the assortment of unique ingredients made it fun to eat. On a recent visit, my husband and I took a savoury turn for our meal (unfortunately they did not have Icy bun available at that time). 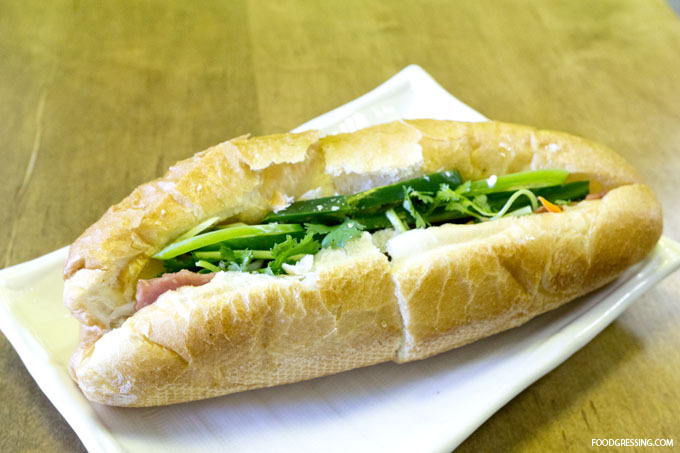 Che-Licious’ savoury items include banh mi sandwiches ($6.50 – $7.25) which come with with pickled veggies, cucumber, cilantro and house made mayo. You can also spice it up with jalapeño. 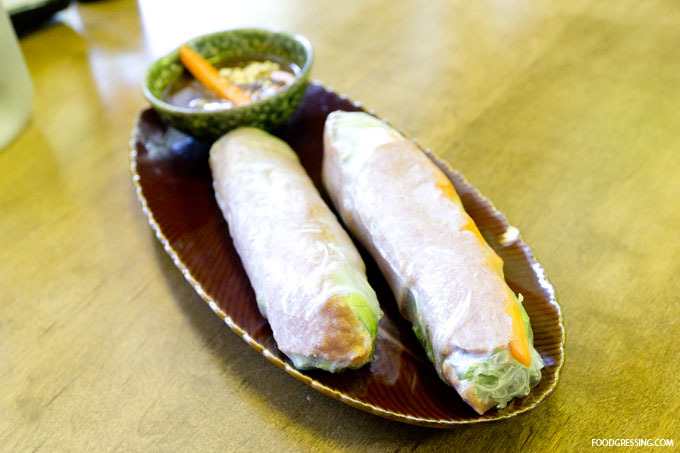 Che-licious also offers salad rolls made with rice paper and fresh veggies ($5.50 – $5.75). Water in jar mugs were brought out to our table. To start, we had the light and refreshing pork bomb salad rolls made with pork patties with a crunch ($5.75). 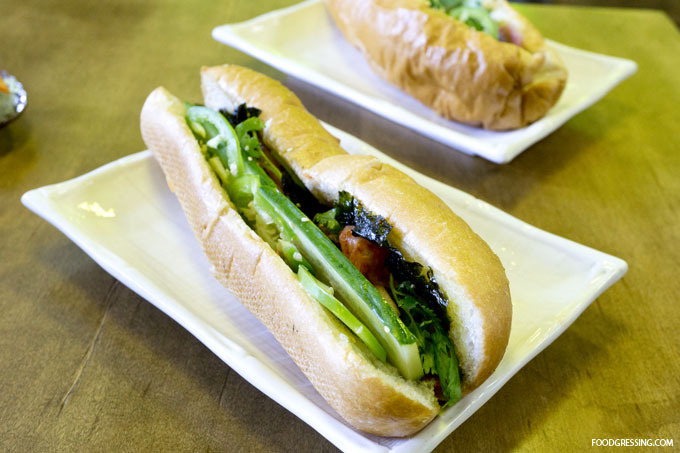 My husband had the Korean-inspired banh mi, Seoul Savoury ($7.25), which had kalbi beef, kimchi, and seaweed strip. The beef was very flavourful and the baguette was wonderfully crunchy but still soft on the inside. I ordered the newest addition to their menu, the Pork-Fection: pork patty and special marinated grilled pork sprinkled with peanuts and spring onion oil. 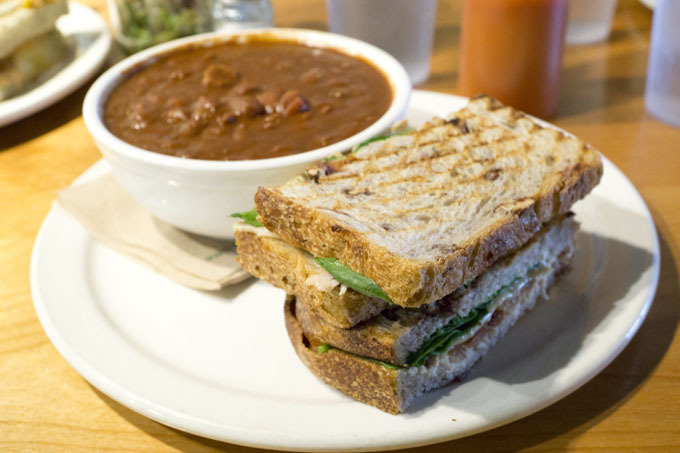 The sandwich had a delicious blend of salty, sweet, spicy and savory flavors in every bite. The bright green interior of Che-licious puts you in a tropical mood. There are some small dining tables, and countertop seating. Meat and Bread has been one of the places I have wanted to try but have never got around to it. It wasn’t until the chef instructor of my casual culinary class at the Pacific Institute of Culinary Arts recommended us to do so. The topic of the class that day was on butchery and he commented on the deliciousness of Meat and Bread’s porchetta sandwich. 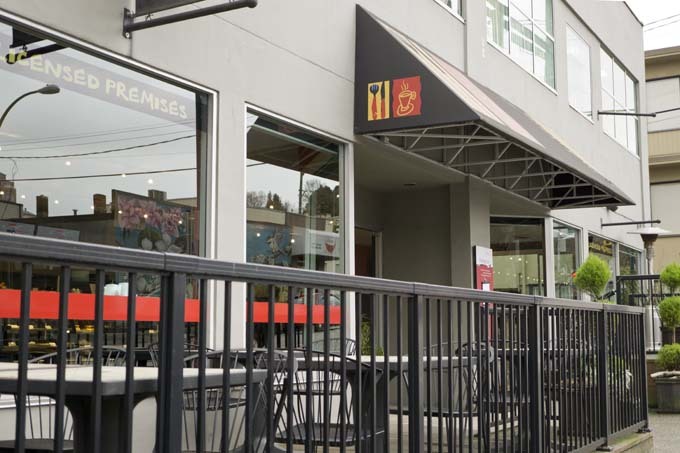 Meat and Bread has two locations in Vancouver (Gastown, Burrard and Pender), Victoria and Seattle. I decided to finally make my way down to the Gastown shop for a late lunch in hopes of trying their porchetta sandwich. 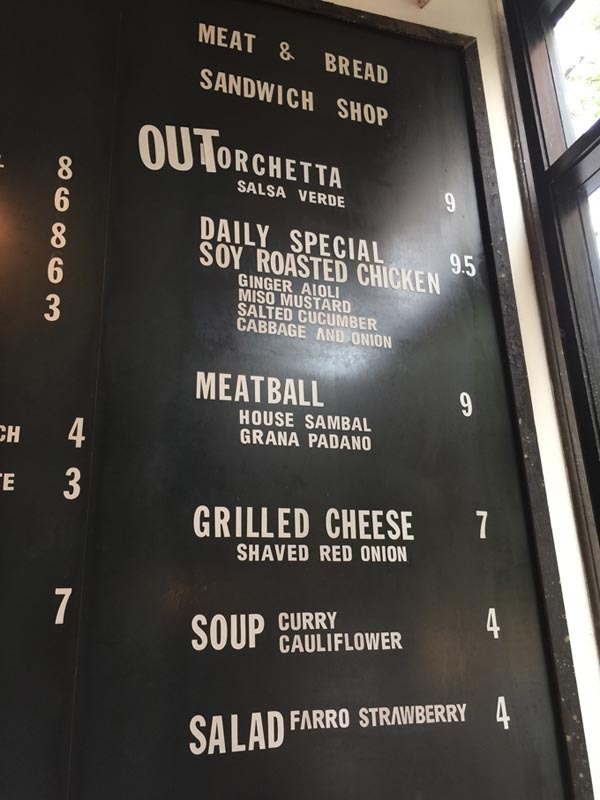 Meat and Bread’s menu is simple. 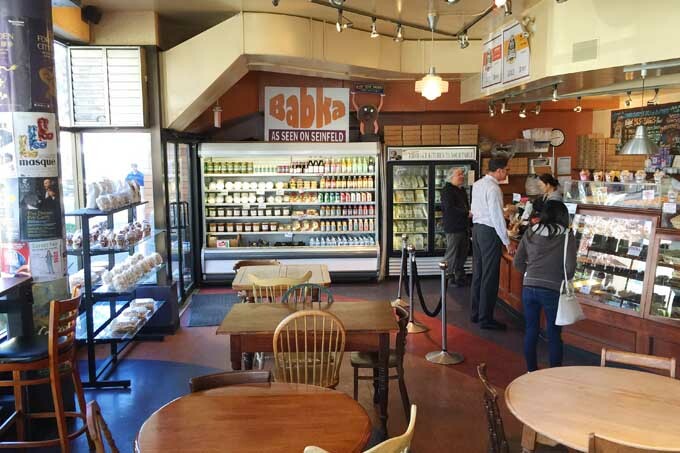 At the Cambie shop, they have 4 types of sandwiches only: Porchetta, Meatball, Grilled Cheese and a daily special sandwich. 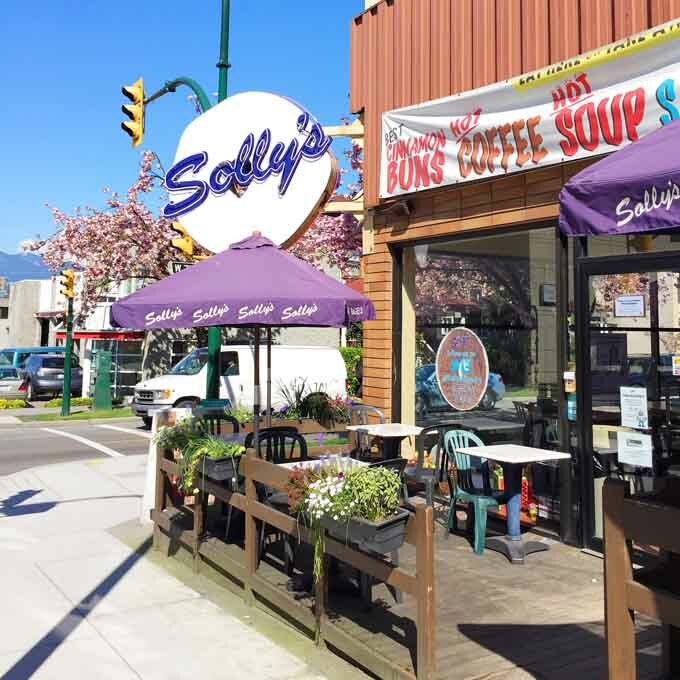 To find out their daily specials, check their Twitter feed or their website. 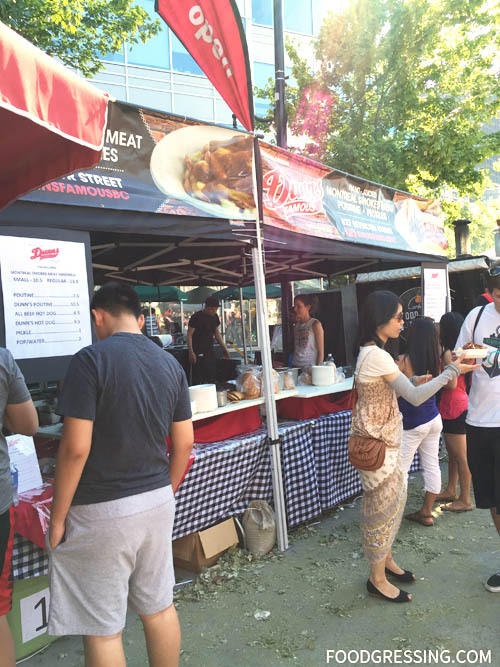 Unfortunately, they had sold out of the porchetta by 3 pm. I knew that I was at risk since I was going late afternoon, but I had my fingers crossed. Nevertheless, I took the opportunity to try out their other menu items including the Meatball and the daily special, Soy Roasted Chicken. 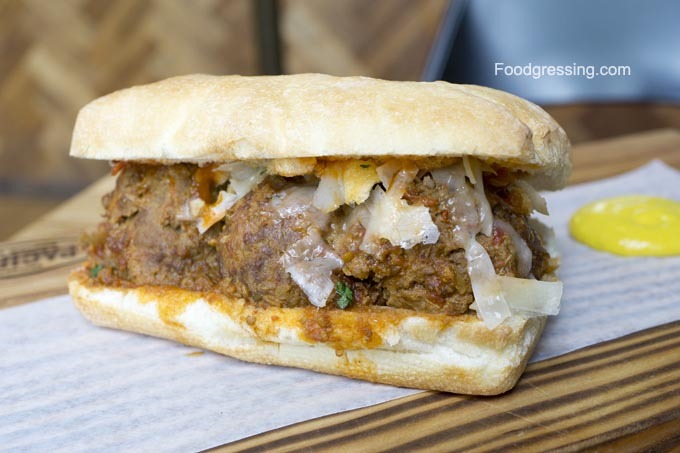 At first sight, the Meatball sandwich ($9) looked drool-worthy. The meatballs were deliciously seasoned and had just the right level of spiciness to tickle your tongue. 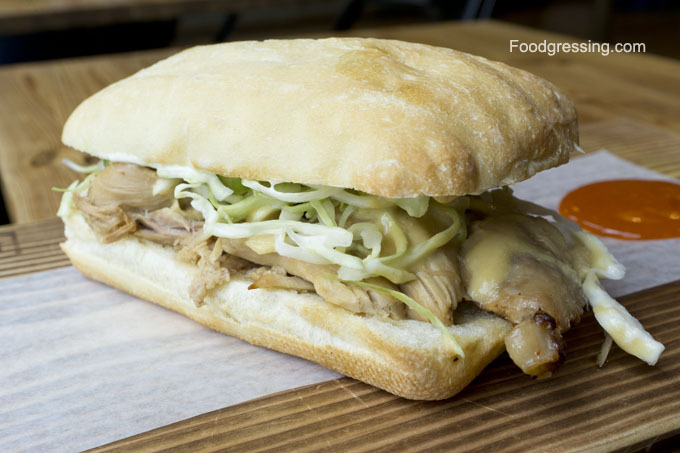 The Soy Roasted Chicken ($9.50) had ginger aioli, miso mustard, salted cucumber, cabbage and onions. The sauce was on the sweeter side and was wonderfully flavourful. 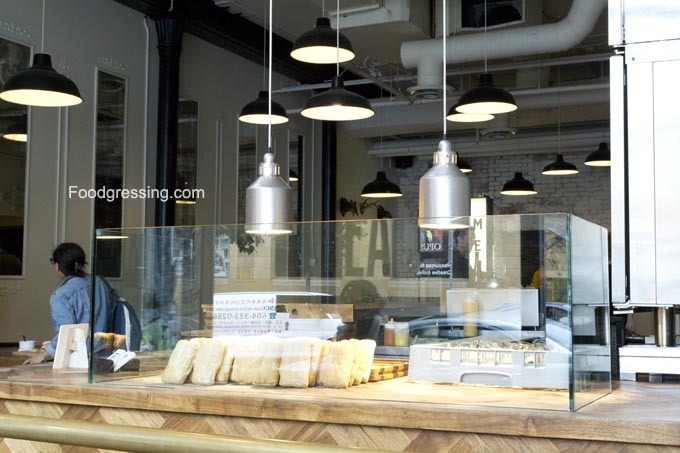 The interior of the Meat and Bread is as simple as their menu. 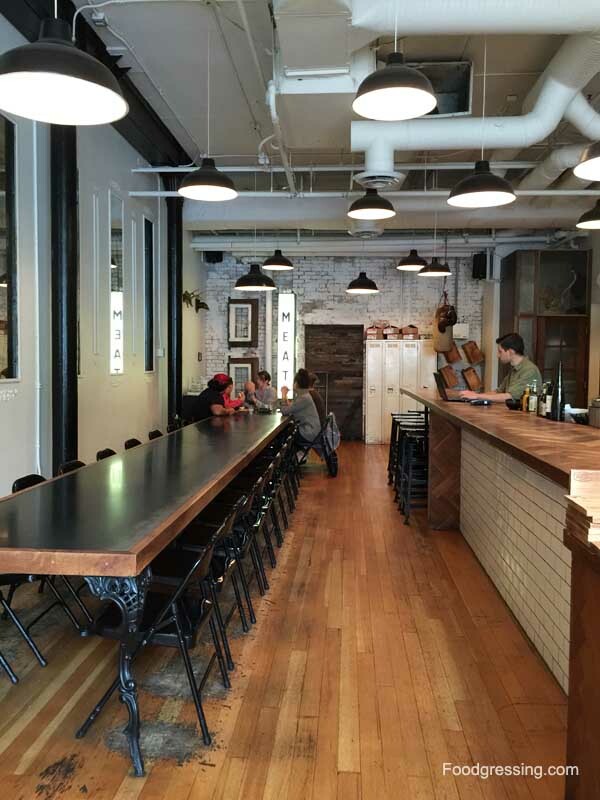 There is a large communal table and a few two person tables near the window. Multiple light fixtures adorn the high-ceiling. As a food blogger who writes reviews about restaurant, taking good photos of the restaurant and their food is part of the job. 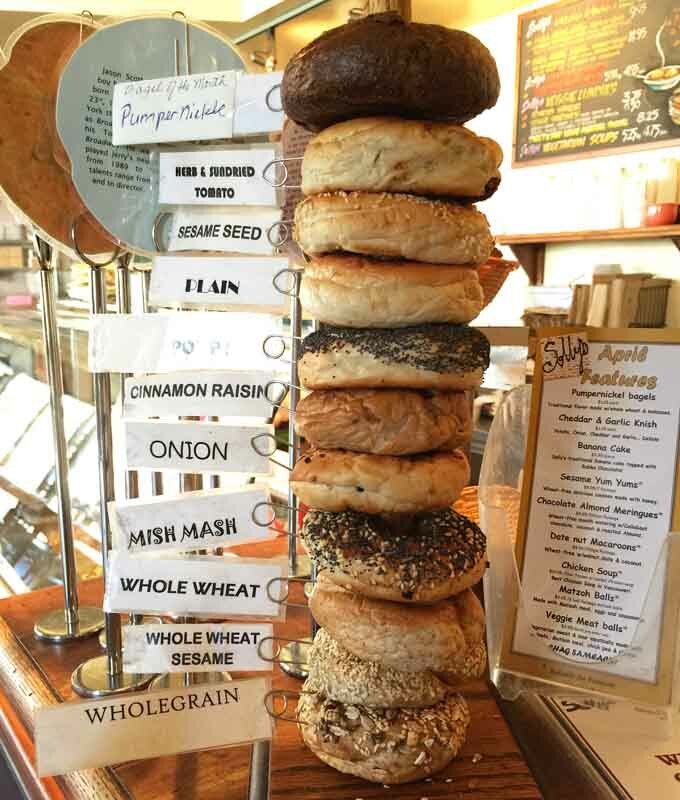 However, on this visit at Meat and Bread, I guess I was taking too many photos because my friend noted that one of the staff, which I am guessing is the manager, was watching me. I thought that due to the number of photos of Meat and Bread on Instagram and my impression of them being social media friendly that they would be okay with it. The staff member did not approach me about my photo taking but I did leave feeling a bit disappointed. I even have a picture of him looking directly at my camera! 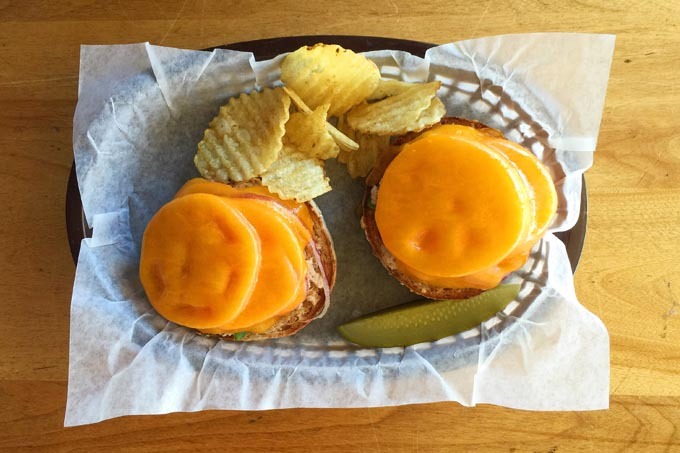 The sandwiches at Meat and Bread were indeed delicious and full of flavour. I was a bit disappointed that I was perceived as suspicious due to my higher-than-the-average customer photo taking. I hope to be able to try their porchetta sandwich at their other locations. 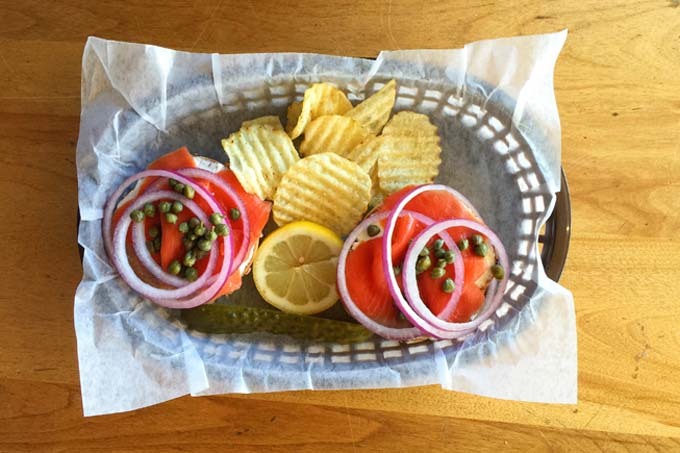 I am a fan of food loyalty rewards apps and the Belly app is one of my favorites. Once in a while, they offer a Belly Bite for free food at local business. It is a great way for me to try out restaurants that I have not been to. 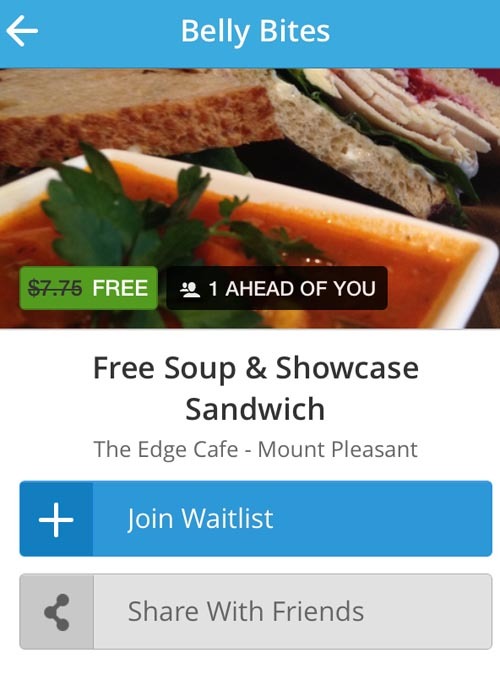 I saw that The Edge Cafe was offering a free soup and showcase sandwich. I had not heard of this restaurant before so I decided to try their food out. 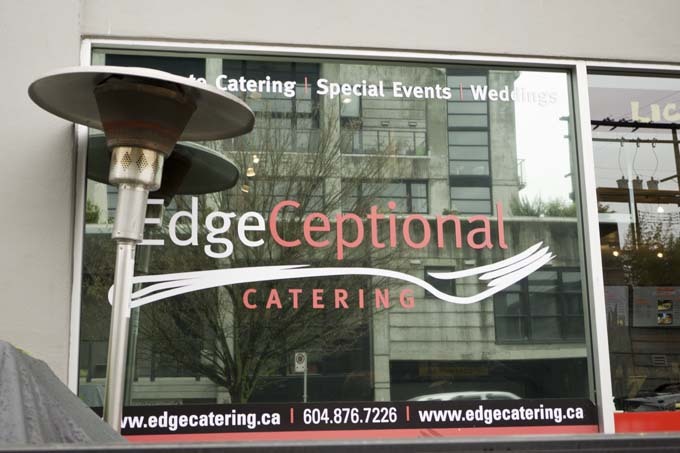 The Edge Cafe is located on Yukon just a block away from the hustle and bustle of Broadway and Cambie. The interior decor is contemporary and very clean. It is a restaurant-style cafe: you order at the front but the food is served to your table and the servers refill your water at your table. 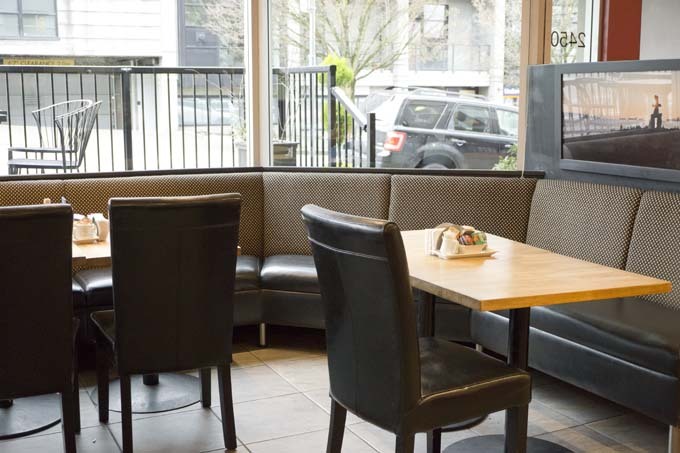 The seating area is quite modern with upholstered high back chairs and bench seating. I bought a 20 oz Cafe Mocha made with 49 Parallel coffee. I had the coconut curried carrot which was sweet, very cozy and comfy. My husband had the beef barley which was a bit on the sour side for him. I really loved the turkey cranberry which was melt-in-your-mouth. It was nicely toasted and the turkey was soft. 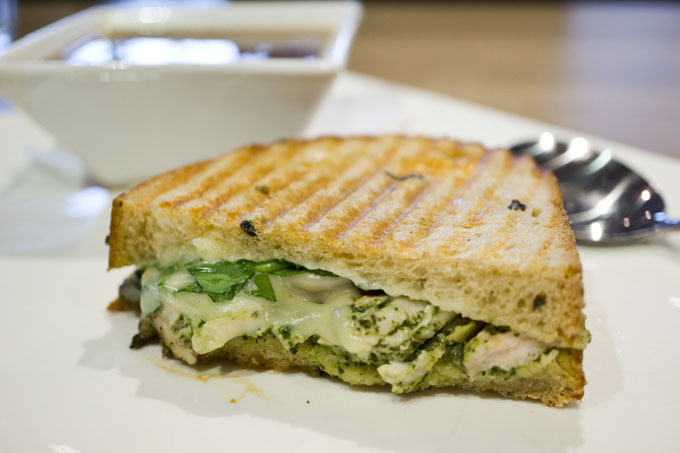 The pesto chicken was also another melt-in-your-mouth sandwich. My husband found it to be crispy and creamy and loved the generous amount of pesto. I saw a neighboring table order the BBQ chicken quesadilla and it looked so tasty that I ordered it too. 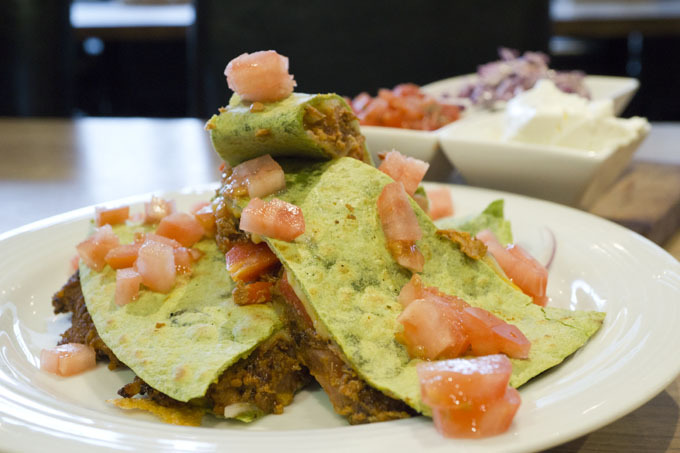 It was slow roasted BBQ chicken, red onion, tomato, bell pepper and melted cheese in a grilled tortilla with sour cream and salsa ($15.95). The quesadilla was delicious and the BBQ chicken was on the sweeter side, which was nice! It was definitely comfort food with the coziness of melted cheese and sour cream. The quesadilla came with a coleslaw, which was yummy. They also does catering for special events and weddings. They also have a patio which would be nice on a sunny day. The service was friendly and our waters were refilled. Their daily features are listed on their website. 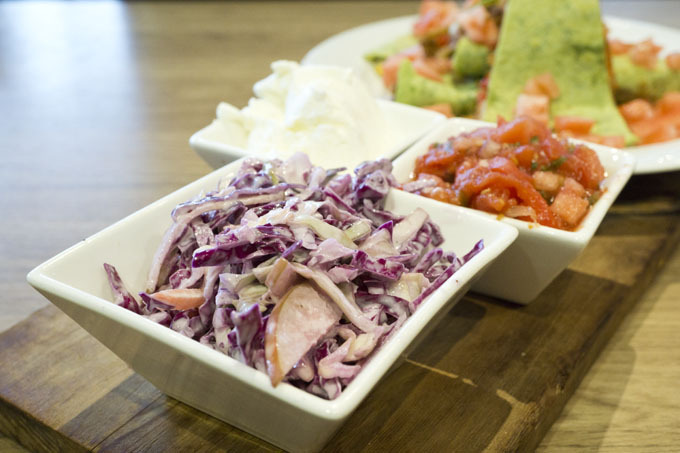 For cozy eats in a contemporary cafe, I would suggest The Edge Cafe. 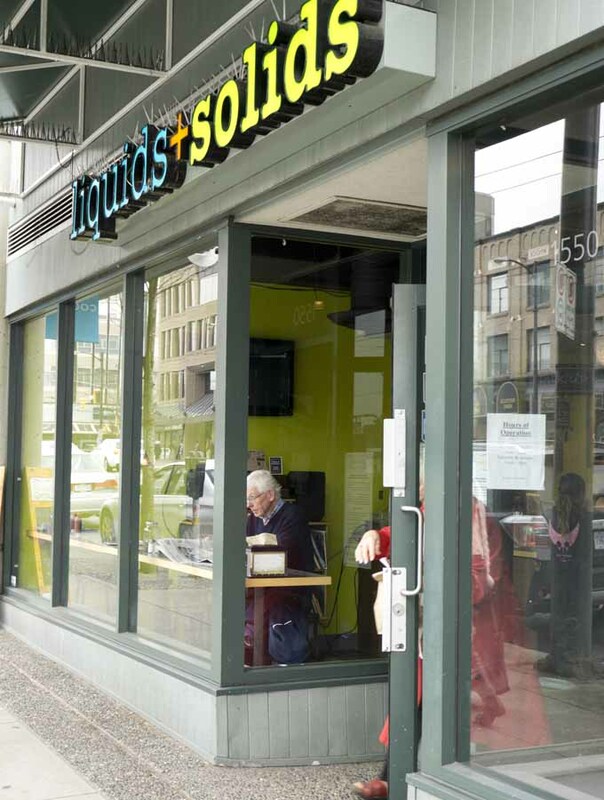 I learned about Liquids and Solids after seeing their Social Shopper deal for $10 for $20 worth of dine-in or takeout food. 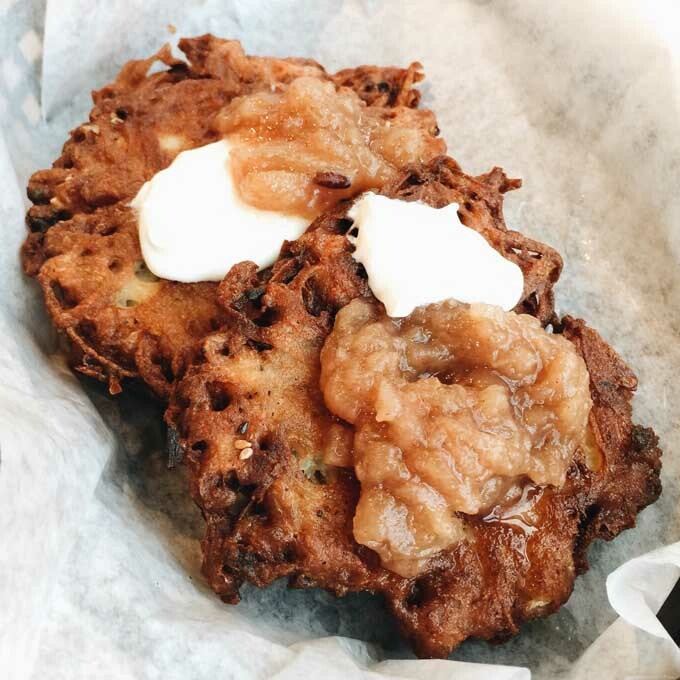 I had never been to any of their three locations, so I decided to try out their offerings with my husband and his out-of-town colleague. The closest location to me is the Broadway and Fir location. It is on the same side as Chapters on Granville, just a few stores down. 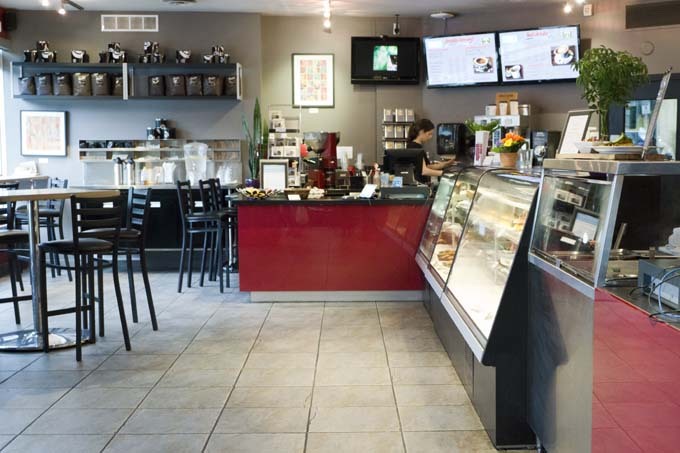 They have also cafes at Hastings and Campbell as well as Veneables and Hastings. 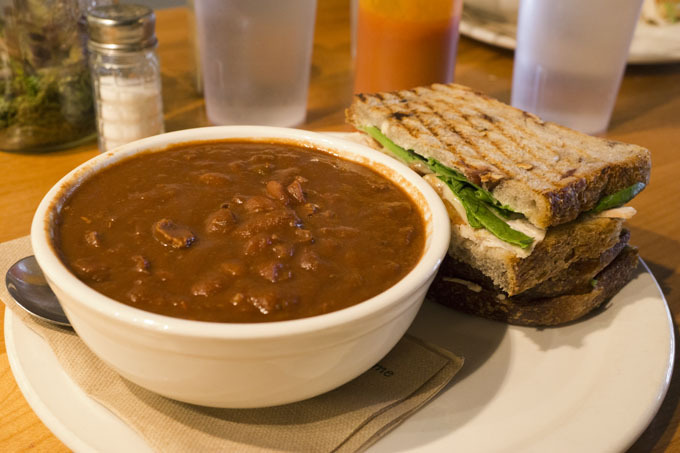 Liquids and Solids has a hearty selection of grilled paninis, soups, stews, chilis and chowders – the total comfort lunchtime food. 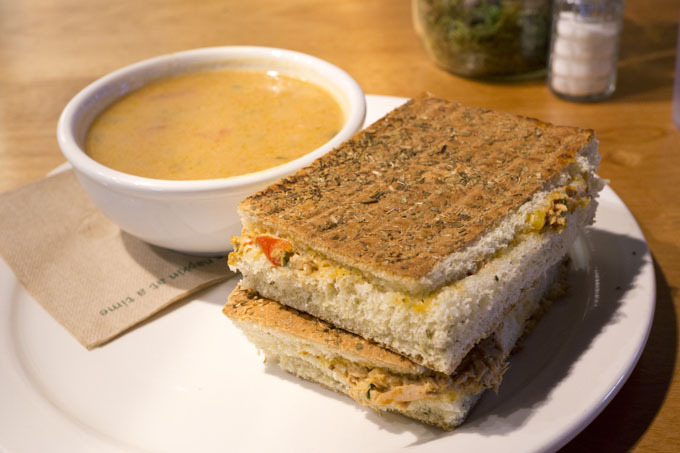 I was really impressed with how descriptive their signs are for their paninis and soups. It took me while to read the signs and figure out what I want because they quite detailed. I decided upon the Tuna Diablo Melt which was creole spiced tuna salad with peppers, shallots and cheddar cheese on herb focaccia. The panini was delicious, nicely toasted and overall tasted. I went with the African Safari which was tomato, peanut, cilantro and chili pepper in a light cream soup inspired by African tradition. 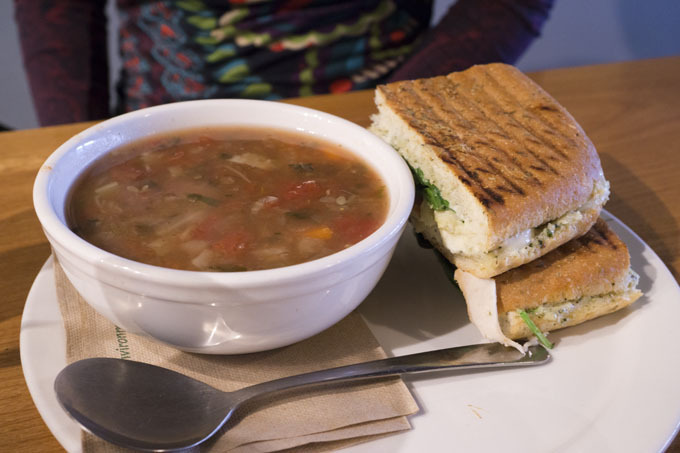 The soup was flavourful and went nicely with the panini. 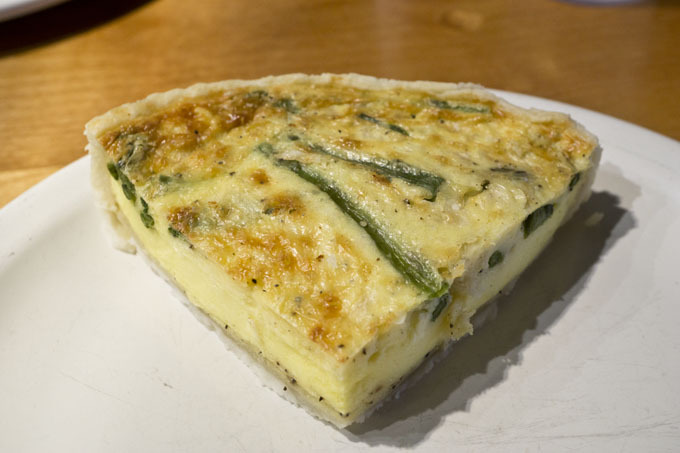 I also tried the asiago and asparagus quiche which was tasty. It was not overwhelming in “asparagus” flavour which was nice. My husband had the Turkey Club panini which was turkey breast roasted in house, emmental cheese, Liquid and Solids sugar cured bacon, spinach, tomato and sweet pomegranate aioli on pecan cranberry bread. He chose a chili to go with his panini. He enjoyed the food very much and found it very comforting. I tried his panini and I thought it was tasty especially because it had a nice sweet taste from the cranberry. 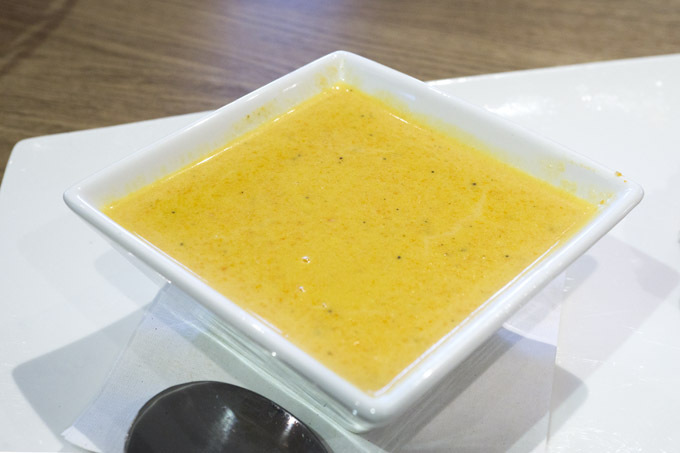 Our out-of-town guest chose Lucky 13, which is one of Liquid and Solid’s healthiest soup. 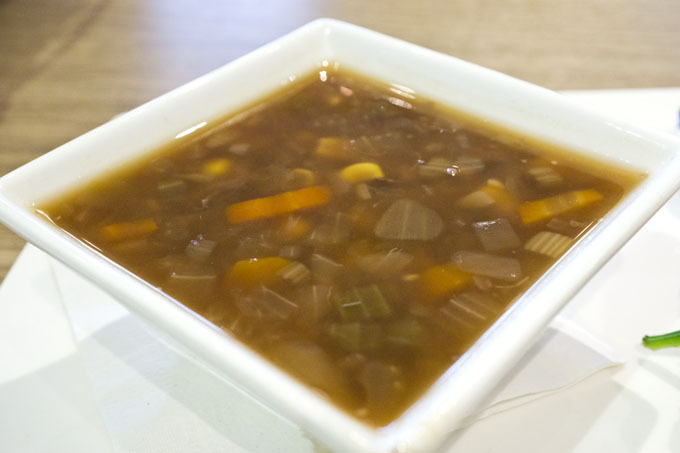 It has a blend of thirteen vegetables, legumes and herbs in a veggie broth. She went with The Grateful Veg which was tomato, artichokes, bocconcini cheese, fresh basil and spinach with Liquid and Solids pesto aioli served on herb focaccia. She loved how healthy the food tasted! I tried a bit of her panini and I loved it because it tasted to “cheeselicious” from the bocconcini. The spread was soft and yummy! For dessert, I had a peanut butter and chocolate cookie. 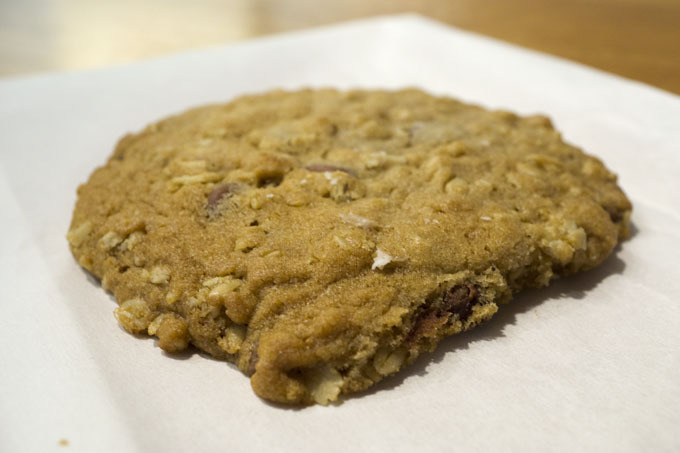 It was a nice soft cookie to top off a fantastic lunch meal! 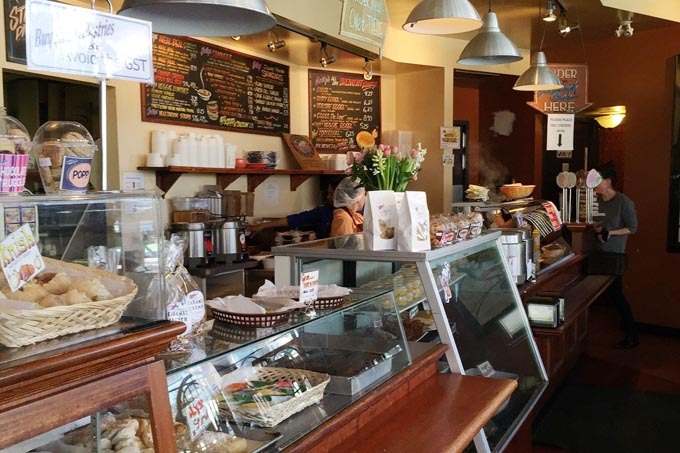 The food at Liquids and Solids is very affordable for the area. 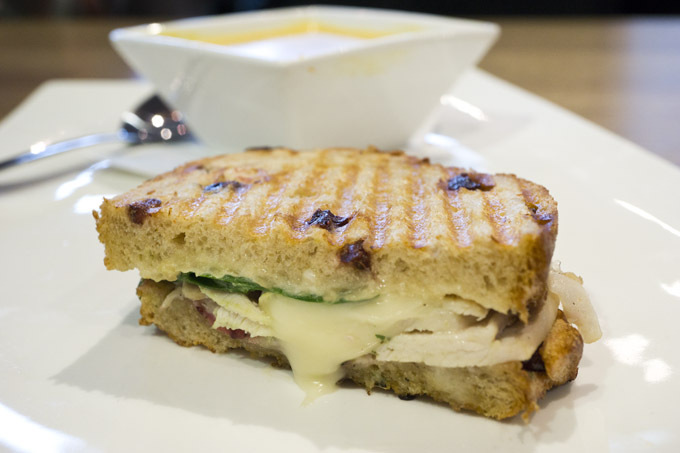 A grilled panini is $8.45, and you can add a soup for $2.95. 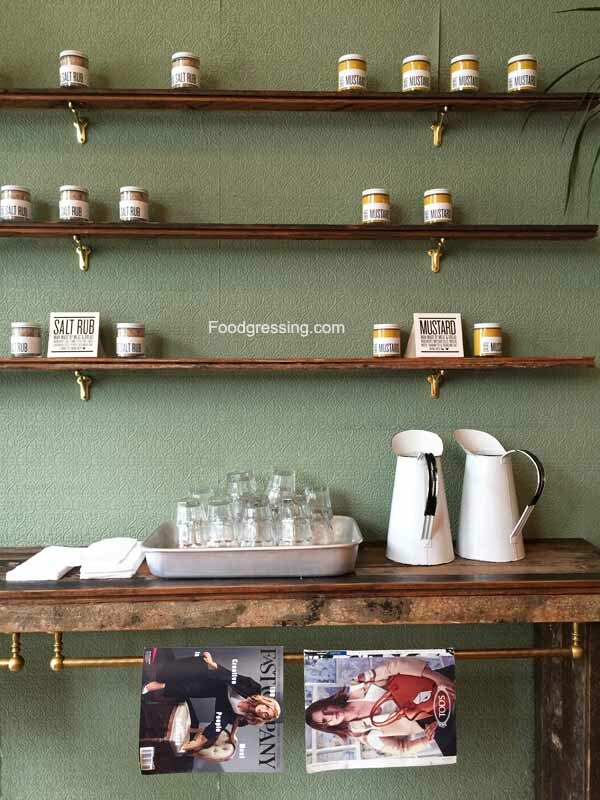 Check out their menu here: http://liquidsandsolids.ca/images/Menu.pdf. 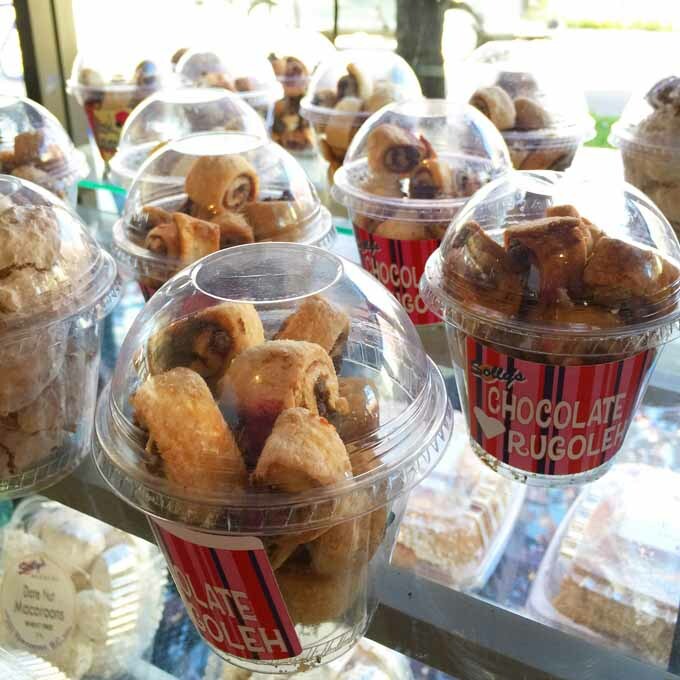 Liquids and Solids uses quality ingredients and no preservatives. 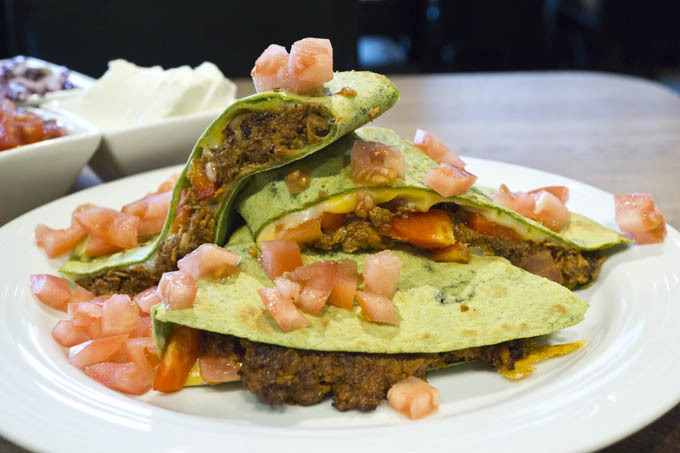 They make everything from scratch and they make an effort to use locally grown produce. Beef, fish and pork are free-range and/or organic.